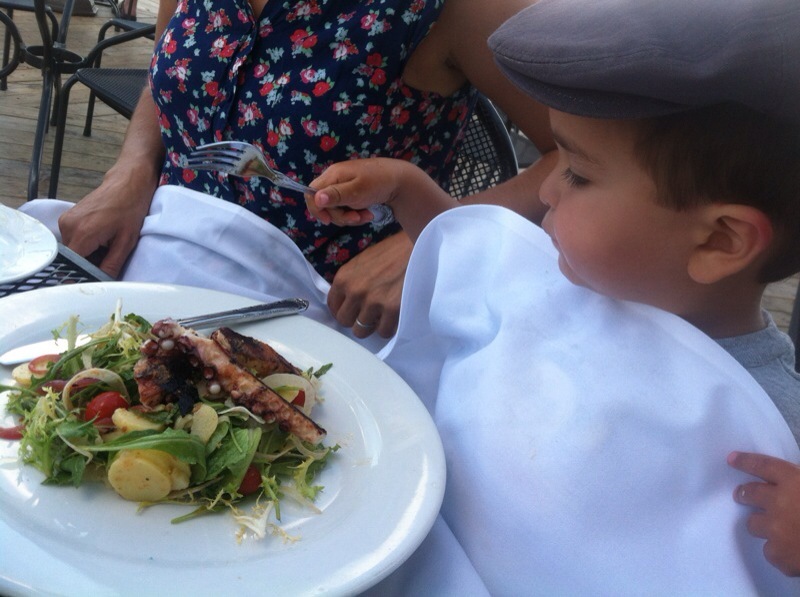 Yep, that’s my 3-year-old digging in to a plate full of octopus tentacles. I love food. Some might say that I like it (and think about it) too much. One of my first memories is sitting at a raw bar at age 3 and my parents giving me an oyster. The people sitting next to me clapped as I slurped it down, and I felt so proud. Delay the carbs: Children love pasta, bread and all things carbohydrate. So start your meal with protein and veggies when your child is really hungry. If you have a pasta or rice dish, bring it out a little later. Don’t tell your children what they like or don’t like: I remember this being a cardinal rule when my brother and I were young. My parents would get frustrated when their friends would proclaim their child didn’t like something before even trying it. My parents knew that children’s tastes change all the time. A child won’t eat something for months, and then one day it will become his favorite food. But if a parent says their child doesn’t like something, this negative reinforcement can often solidify a child not liking a food, even if they’ve only tried it a few times. Make your kids try everything: There was a rule at our house that you had to try everything on your plate. You didn’t have to eat it, but you had to try it. If you didn’t eat it, there was no talk of not liking it. Our parents told us that because tastes change, you had to try it at least ten times. Involve them in the grocery shopping and cooking: From as far as I can remember, my brother and I were always in the kitchen helping out. My dad also loved grocery shopping and passed that on to both of us by involving us. Recently, my 2 year old started demanding to unload the entire cart himself onto the conveyor belt, so I now clear a space for him inside the cart, plop him in and let him have at it. As young children, we saw shopping and cooking as a fun activity, and eating the foods we prepared was a key part of that. Make them eat the same food you eat (and eat a variety of foods yourself! ): My parents never became short order chefs. We ate what they ate. The same went for restaurants. We never got to eat chicken fingers off the kids menu. They either ordered us half portions of regular meals, or if the restaurant wouldn’t do that, we ate off their plates. My mom’s (mostly hidden) pickiness aside, my parents ate interesting foods themselves, which modeled for us a varied palette. This is what my parents did (and what I’m trying to do with variable success with my own child). What do you do to encourage your kids to be good eaters?